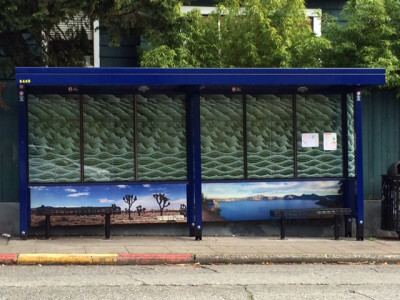 Photographic Center Northwest (PCNW), King County Metro and Youth in Focus are looking for inspiring images to be installed as public art on King County Metro bus shelters through the public art project, City Panorama. The theme for 2016 City Panorama is open, so creativity is king! Photographs can be submitted via CaFE (www.callforentry.org) between February 1 and March 20, 2016. 100 photographs will chosen and printed on 2’ x 8′ wooden panels and will remain installed in King County Metro shelters for up to 10 years. Submissions will be reviewed by a panel of jurors from Metro, PCNW and Youth in Focus. Chosen photographs are prominently displayed throughout Seattle and greater King County. Many photographers don’t necessarily shoot in a panoramic format, but you can crop your work to fit the 4:1 ratio. Take a slice out of your image – or stitch several images together. This is great opportunity to be creative – and do something unique with your work! The City Panorama Project began in 2010 when King County Metro, WA partnered with PCNW to expand the public art scene in Seattle and other cities in King County. As a way to incorporate art into everyday life, to beautify Seattle and other cities served by Metro, and to make new perspectives and ideas available to all, the City Panorama Project seeks photographic artwork that will accomplish these objectives while increasing the visibility of the photographic arts. Over 450 photo murals have been installed since the launch of this public art project in 2010. This annual project is funded through a 4Culture grant and now enters its sixth year. All entries must be entered into CaFE by March 20, 2016, 11:59 PM Mountain Time, Denver, CO. Submissions that do not come through CaFE will not be accepted. Click here for submission. The entry fee is $20 for 5 jpgs. You may submit additional jpgs for $5 each up to 10 jpgs total. You may submit an artist’s statement with your entry. Payment must be in U.S. Dollars. Entry fees are non-refundable. All artists will be notified by CaFE about selected and non-selected images for the project in late April, 2016. Further instructions will be emailed through CaFE about submitting final files. Alex Levine, Ann Pallesen, Annu Palakunnathu Matthew, Archana Bhat, Belen Campillo, Carina del Rosario, Carrie Yuan, Christopher Hearne, Conrad Chavez, Constance Brinkley, Daniel Lebu, David Kohler, Deb Stoner, Deirdre Toomey, Diana Scheel, Doran Bastin, Dorothee Brand, Doug Mouw, Doug Manelski, Evangelea Seelye, Frank Greif, Gabriela Cociuba, Gary Thompson, Gregory Mather, Hal Gage, Jaime Pollock, Osamu James Nakagawa, Jenny Riffle, Jens Titterness, Jeremy Snodgrass, Jesse Miller, Jim Hellemn, John Armstrong, John Taylor, John Walser , Judy Allen, Julianne Duncan, Karen Dohr, Karen Portzer, Karen Halsey, Kimberly Shavender, Lana Blinderman, Leslie Zukor, Linda Enkema, Lisa Jones, Mallorie Ostrowitz, Marcela Gara, Marco Garabello, Marian Bodart, Marika Pentikainen, Mark Francis, Marlin Greene, Michael R. Anderson, Nancy LeVine, Olivia Crutchfield, Patricia Fortlage, Patricia Jollimore, Pernille Westh, Rachel Cash, Rick Posmantur, Robin Carter, Scott Rinckenberger, Shannon Milner, Stanley Mandell, Stephanie Araiza, Stuart Allen Levy, Tara Champion, Terry Morton , Theresa Batty, Yar Runyon, Ying Chen, Zoe Welch & Youth in Focus artists: Jacqueline L., Jesse C., Kaya N., Long T., Maddy K., Maria T., Mari S., Stella S., Ariana G.